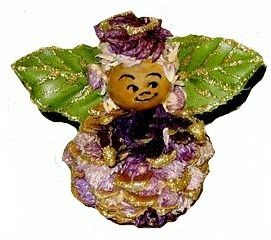 This is an easy homemade Christmas craft that uses potpourri and a pine cone as the basis for a fragrant pine cone angel Christmas ornament. Warm up your glue gun and go! brows, nose and mouth are just shallow arches. 2. Position the bead on top of the pine cone. You may be able to use the uppermost part of the pine cone to push through the hole in the bead to anchor it in place; if not, secure with hot glue. 3. Now begin pushing potpourri flowers in between the spiral layers of the pine cone, filling all the spaces you can. Just beneath the head, position two potpourri seedpods as arms. 4. Glue on the leaves to form wings at the back of the head. My rose leaves were joined in a group of a three, and I rolled up the third one, gluing it in place so that a thread to hang the ornament can be strung through it. 5. Heat the glue gun, and smooth some gold glitter glue over the head where you want to position hair. Either sprinkle the wet glue with small leaves of potpourri or use it to secure doll hair. 6. Use the glue gun to outline in gold glitter glue the veins and outline of the leaves. Don’t worry about the glue “strings” – these can easily be removed by nails scissors or tweezers when the glue is dry.